While going to an art museum is a great way to view iconic pieces, the new game UkiyoWave goes a little further. Based on iconic piece The Great Wave from famed Japanese artist Katsushika Hokusai, the minimalistic action game is all about catching a wave. All the waves move dynamically and smoothly. You’ll need to swipe left or right on the screen to move and jump on on the waves. When successfully riding each wave, you’ll be able to score. Play continues until you completely fall to the bottom of the screen. 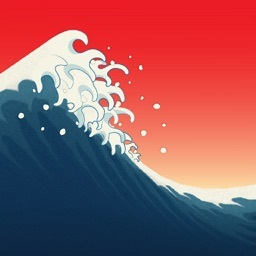 UkiyoWave is designed for the iPhone and all iPad models. It can be downloaded now on the App Store for free. The Great Wave stage is free to play. But you can unlock the complete games, featuring other iconic images from Hokusai like Red Fuji, with a $2.99 in-app purchase. If you’ve ever wanted to do more than just look at art, UkiyoWave provides a unique way to experience pieces from the well-known artist. The gameplay takes just seconds to learn, and you’ll be taken by the beautiful scenery. Taking inspiration from famous Japanese artist Katsushika Hokusai and his iconic print The Great Wave, UkiyoWave is a beautiful and unique action game. Next articleunit tests – Testing internal dependencies – inject a mock of itself, or refactor into new class?